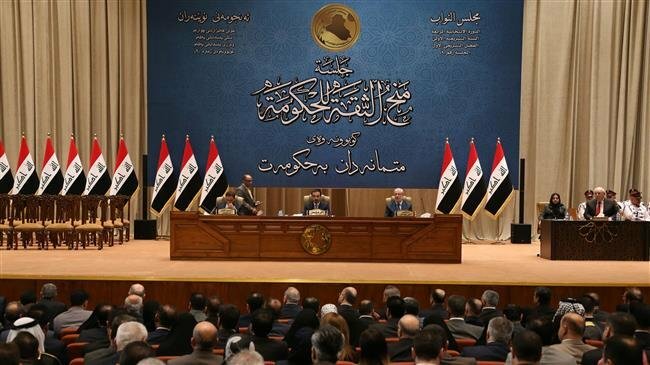 Iraqi lawmakers have called for the withdrawal of US troops, saying they see no justification for the presence of foreign troops about a year after the defeat of the Daesh terrorist group in Iraq. The American presence “is, in my opinion, a violation of the Iraqi sovereignty,” Amer al-Shebli, a lawmaker, told Press TV on Friday. “After ending terrorism, the previous Parliament should have taken a serious action to force all foreign forces to leave Iraq,” the MP added. “Sovereignty is the most valuable asset in any nation. The sacrifices of the Iraqi people in their fight against Daesh show how important their country’s sovereignty is for them. Today, no country will allow foreign military bases on its land,” said another legislator Kadhim al-Sayadi. Some lawmakers said the presence of US forces in Iraq had to be based on a legal framework. “The presence of any foreign forces inside Iraq can only be done through agreements with the Iraqi government, and these agreements cannot be passed without the approval of the Parliament,” said Diar Barawri, an MP with the Kurdish Democratic Party. Another lawmaker expressed concern over the ever-increasing number of US forces in the country. “The presence of US forces in Iraq is illegal. As a member of the Parliament’s Security Committee, we voice our concern over the presence of the US military and the constant increase in the number of the soldiers,” said Adnan al-Assadi. “They have thousands of soldiers here. Yet, the government says they are advisors,” he added. “Lawmakers who are part of Hashd al-Sha’bi’s campaign to liberate territories held by Daesh terror group believe it is time for the country to once and for all be free of any foreign military presence,” said Press TV correspondent Ali Musawi. The volunteer paramilitary militias, also known as the Popular Mobilization Units, played a significant role during Iraq’s uphill battle against the terrorists. The efficiency of their involvement prompted Baghdad to incorporate them into the country’s national defense forces. The United States invaded Iraq in 2003 under the pretext that former Iraqi dictator Saddam Hussein had weapons of mass destruction, an allegation later proven wrong. In 2014, it led scores of its allies in a so-called mission to defeat Daesh without a UN mandate. Iraq and its allies forced the group out of Mosul, its headquarters in the country’s north, late last year. The US-led coalition, however, still retains its presence in Iraq after Mosul operations. Last week, Arabic-language Arabi21 online newspaper cited MP Ahmad al-Assadi, the leader of the Iraqi Construction Alliance, as saying that the legislature would discuss withdrawal of the US forces amid rising unease at Washington’s meddling in Baghdad’s internal affairs. He said the lawmakers would step up their demand that the Iraqi government force the foreign troops to leave. The official said calls for the withdrawal of foreign troops had begun during the last legislature, but lawmakers were now seeking a “clear timetable” for a pullout. Picture shows the interior of the Iraqi Parliament as seen on October 24, 2018. This article is from November, with President Trump’s recent statement I would say that the departure of US army from Iraq (completely) is much overdue.